Home Mobiles How To Buy Oneplus 5 Now Without Waiting For Next Sale? How To Buy Oneplus 5 Now Without Waiting For Next Sale? Oneplus launched the most awaited Oneplus smartphone in India yesterday, Oneplus 5. It packs some top of the line specifications and a decent price tag. We mentioned the word “decent” as there are mixed reactions for the Indian pricing. The base variant i.e., 6 GB RAM starts at ₹32,999 and goes all the way up to ₹38,999 for 8 GB RAM variant. The smartphone went on sale for the first time on Amazon, but it was only for a day. The next sale starts on 27th June 2017. You have to wait for the next sale to buy Oneplus 5. 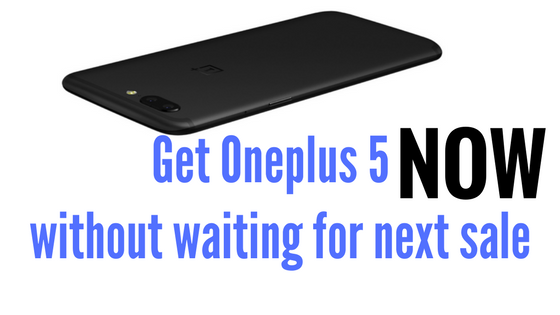 How to Purchase Oneplus 5 now without waiting for next sale? Oneplus allows users to purchase the smartphone with an invite code right away without waiting for the next sale. People who registered on Oneplus’s Official Website will receive a special invite code wherein users get early access to buy the phone. The invite will be valid from June 22 16:30:00 IST to June 26 23:59 IST. Like, Share and Comment if you found this post helpful.